Since the migration to Skype for Business, the vast majority of phone numbers for individuals and departments have changed. Your new direct dial phone number is now part of your user identity in the same way your email address is. This number will remain with you for the lifetime of your IT account and will follow you from place to place. For departments phone numbers are a bit different. It used to be that the primary contact belonged to a phone on a desk. Now that the administrators or primary service contacts have their own personal numbers, you do not want to advertise those as the primary contact number – if this person leaves the university or moves to another role, they will continue to receive calls for their published number. In order to get around this issue we can create a Skype for Business Response Group, similar to the old style call groups. A Response Group creates a permanent phone number for your department which, when called, one or more members of your department or team can answer. If you would like a Response Group created for your area, or would like to find out more about them, please log an Assist ticket using this form and an IT representative will get in contact to discuss the details. Further information on Response Groups can be found in the Skype for Business online help documentation. All new permanent employees will now be automatically provisioned with a Skype for Business account along with a personal DDI telephone number – Managers and Team Leads will no longer need to raise a request for this. Please note that Persons of Interest and Casual staff who require a telephone number will need an IT account and an email address, and will still require a request be logged via the Self Service Portal in order to provision the new starter with an account. If you are wanting to call or IM (Instant Message) someone but they are away from their desk, in a meeting or otherwise busy, you can “tag” them so that you will be notified when they become available. NOTE: Remember to untag them afterwards otherwise you’ll get a pop-up every time their status changes. Thanks to Bronya Don and Karen Mather for this tip. There are times when it is useful to email the participants of a meeting. You might wish to send them an agenda, file, or reminder; ask a question; and so on. You can also email only those invitees who accepted a meeting. 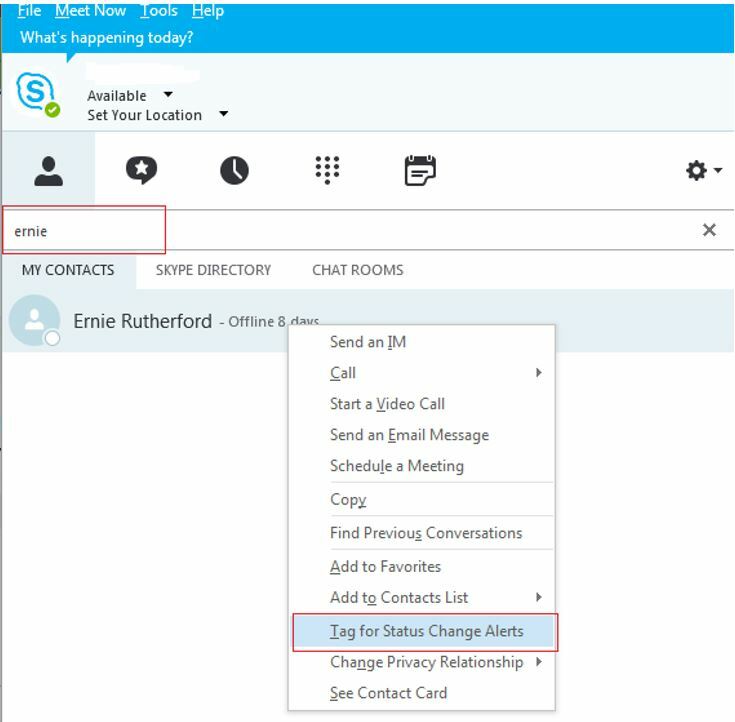 Remember too, that you can conduct and attend meetings without leaving your desk, using Skype for Business.